5 bedroom, 3.5 bathroom villa in the Glenbrook community. Owned by andy downing. Ref: 3340. 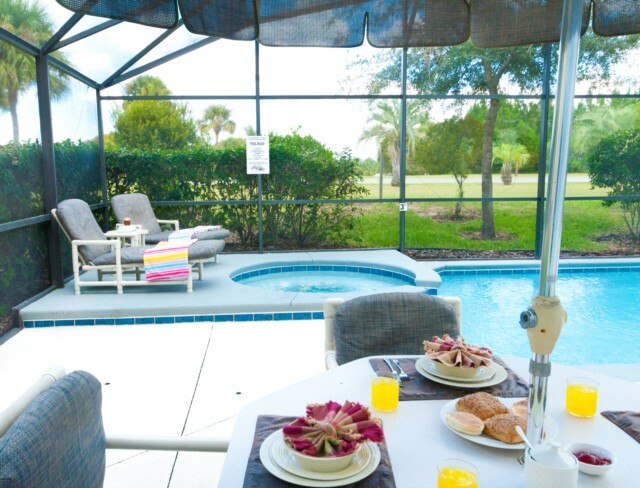 If you are looking for a luxury 5 bedroom Florida vacation rental home with a secluded, screened private pool with Jacuzzi and extended sundeck ,then look no further! Our villa is fully air-conditioned with two large living areas and a Games room, all rooms very tastefully furnished! 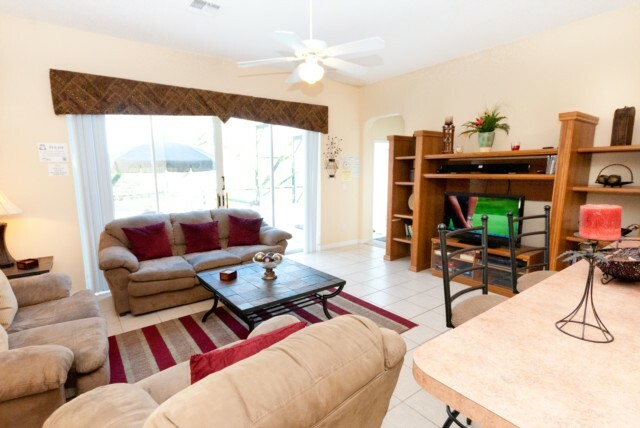 We are only minutes from Disney and can comfortably accommodate up to 10 people plus children under two. •	Secluded outlook to the rear – no one overlooks you! 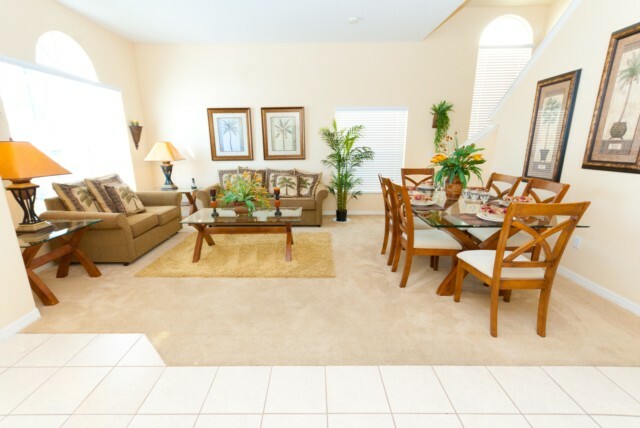 The Villa is situated in the lovely Resort community of Glenbrook. It is in a peaceful location and yet has the advantage of being located on Hwy. 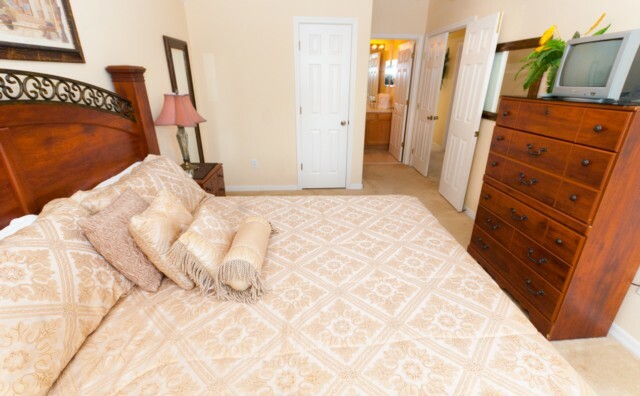 27, which is close to the 192 with all its restaurants and facilities; Disney is only a 10-minute drive away, Sea World and Universal 20-25 minutes and great on-site facilities. The villa is in a quiet location on two floors and has ample parking for cars with a large driveway and double garage. There is 2,430 square feet of living space and is fully air-conditioned throughout with separate controls for upstairs and down. The pool area has a large extended sundeck area complete with quality patio/pool furniture, ideal for breakfasting after a morning swim. The swimming pool has a Jacuzzi hot-tub and is covered by a fully enclosed screen. The large sundeck area is ideal for evening meals or just simply relaxing, whilst enjoying a long cool drink! The family room, which is adjacent to the kitchen and dining nook, has a large corner settee which seats 6 or more a seperate armchair and occasional furniture. There is a 37” HD flatscreen TV,upgraded cable with sports, and a DVD Player with soundbar surround-sound. Visit the community clubhouse and borrow free of charge a DVD or PS3 game after a busy day in the theme-parks. There is also a selection of games,books. This family area leads onto the heated swimming pool and is tiled. A small toilet with wash basin & storage is just off the family area providing direct access from the pool area. The central kitchen is open plan and is combined with a breakfast bar (siting two bar stools) and nook (siting a table with four chairs). It is superbly fitted out with all you will need including electric cooker with self cleaning oven, toaster, microwave, large fridge freezer, coffee maker, blender, ice maker, waste disposal and dishwasher, etc. The laundry room is next door complete with full-size washer, tumble dryer, laundry basket, plus iron and ironing board. 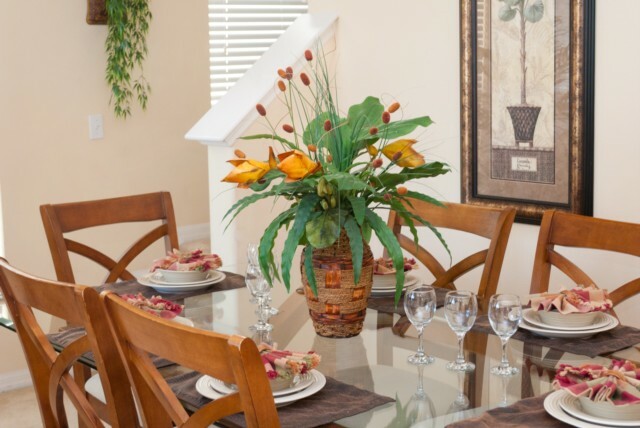 The separate dining room at the front of the house has formal seating for six, and there is a good supply of crockery, glassware, cutlery and cookware for at-home dining. This room also features a sitting area with two settees and offers a quiet room to relax in. One settee is a sleeper. A computer with free broadband high speed internet access is provided in the formal lounge. 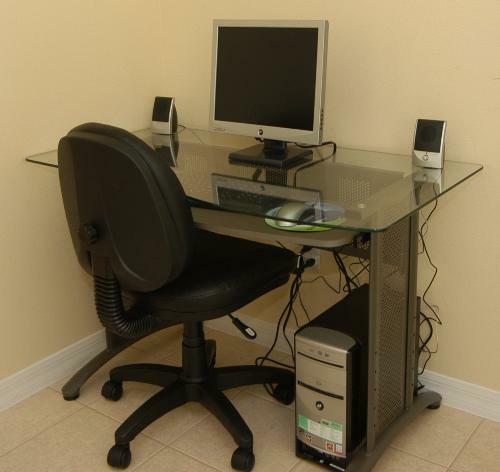 You can also bring your own Laptop and connect to our Wireless modem. On both the ground floor and the upper floor, there are master-suites with en-suite bathrooms, both with king-sized beds. 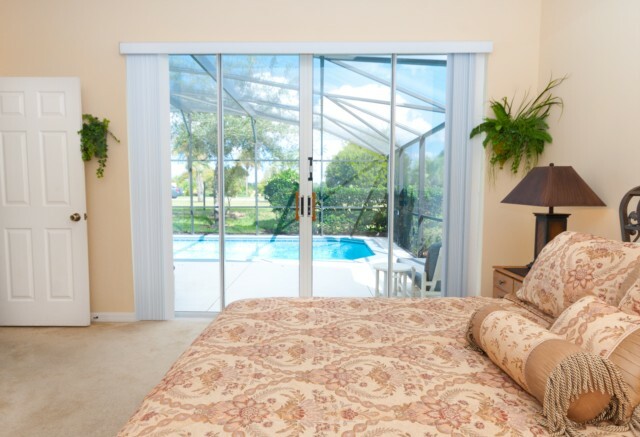 There is direct access to the pool from the ground floor master with sliding patio doors. There are walk-in closets, night-tables, lamps and clock radios. Both rooms have 24in flatsreen digital cable TVs. There is a third double room with fitted robes on the upper floor, which also has cable TV. 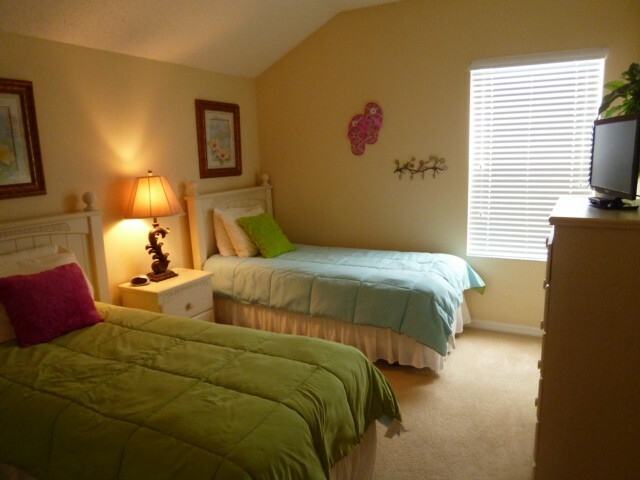 There are two further bedrooms each with two single beds. Both have a nightstand, reading lamp, built in wardrobes (with plenty of space). Both twin rooms have 22in Flatscreen Digital Cable TV and a Sony Playstation II with games in each. 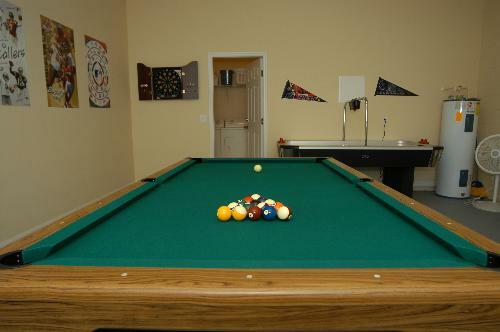 Our Games Room is equipped with a professional 7ft Pool table, Air Hockey, Fussball & Electronic darts. 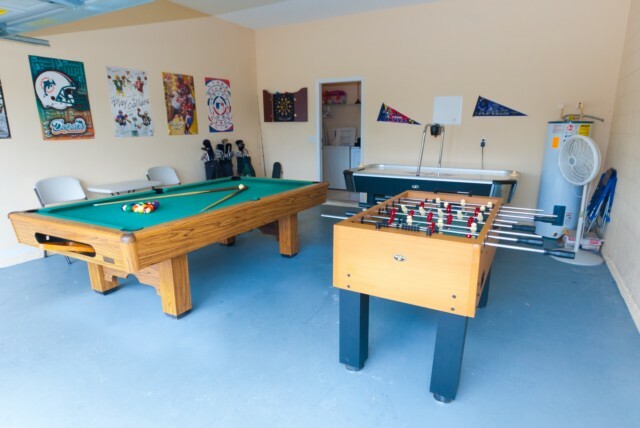 It can be returned to garage use in the event of inclement weather as the floor has been painted and the games equipment can be moved to one side if required. We have three sets of golf clubs in the villa which guests are welcome to borrow free of charge! The Villa is south facing and features a large extended pool deck which means that the pool area gets the sun over the house all day long. Good quality pool/patio furniture is provided for your added comfort. The extended decking really makes a difference if you are spending a day at the pool with all the family!! The pool area enjoys a quiet secluded aspect and can be heated if required in the cooler times. A hot tub/spa is also provided which can be heated to a higher temperature than the pool if desired. Landscaped gardens surround the house...just watch out for the sprinklers that come on automatically. Glenbrook is a new community located on the Highway 27 (North) in Clermont. 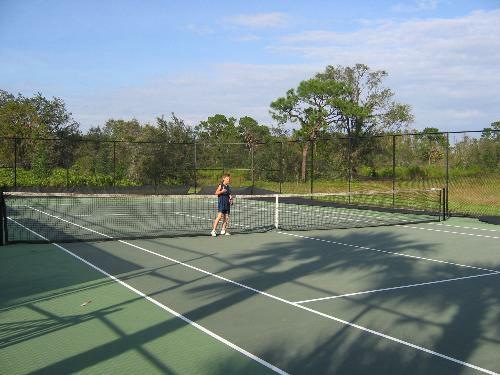 It is a highly desirable private development 6 miles from Disneyworld, within easy reach of main highways to either coast and major international airports. There are golf courses, countryside and shops all close by. Local facilities within a 2 mile radius include a 24 Hour Wal-Mart , Sweetbay Supermarket at the entrance to Glenbrook, pharmacies, post office, video stores, gas stations, and numerous restaurants/takeaways. Besides having exclusive use of one of these private villas, guests can also access free of charge community resort facilities all within a 5 minute walk if desired. These include a Childrens Playpark,tennis and volleyball courts, gym room and designer swimming pool with fountain. There is a wonderful clubhouse has a large screen TV, computer with internet acces,free DVD hire from an extensive library & kitchen facilities. There is also a media room with a large TV entertainment system, a PC giving free internet access as well as a wireless hot spot for those bringing laptops. A fully equipped games room boasts pool and air hockey tables. * Child safety fence poolside. Had a lovely stay! A beautiful villa - excellent decor. Convenient for all amenities. Thank you! Thanks for a great week! Felt just like home - See ya again! Fantastic Villa! Plenty of room for all of us and great fun in the swimming pool,Thanks. Beautiful house! thank you for letting us share it with you. Lovely house, well equipped for everyone. thanks! 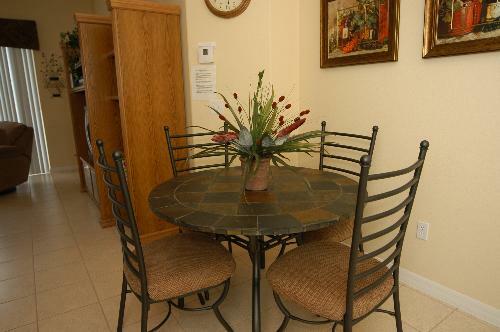 The house is nice and spacious and suited our own needs admirably, being ideal for the attractions and gulf coast. 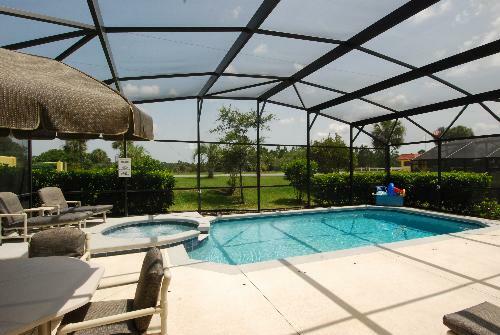 We really enjoyed our stay down in Orlando.The house was great.it was a great week in Florida – the pool and hot tub worked We will consider renting again from you next year. Lovely Villa! Fantastic holiday cant wait to come back,pool & spa lovely and warm, thanks for lending us your home. We had a wonderful time! The house is beautiful and very comfortable. We enjoyed our stay.The house is well kept and we loved the pool and the pool table!! Your villa was very much as described and all of us found the facilities to be ideal. My mother and father particularly enjoyed the freedom and space, and the luxurious downstairs master and en-suite. None of us had stayed in a private villa before and we would definitely do it again should we be vacationing in such a large party. I will not hesitate to recommend your villa and website to friends in future. Weve had a great time! The pool and games room we didnt use too much.it was good that we were close to Disney. The house is big and had everything we needed. Wonderful home! enjoyed our stay,very much enjoyed the pool. Great house! Everything working fine, a beautiful setting,pool excellent for the kids. The house was much appreciated. We have just come home from our wonderful vacation in Florida. We are so pleased with the stay in your house!! 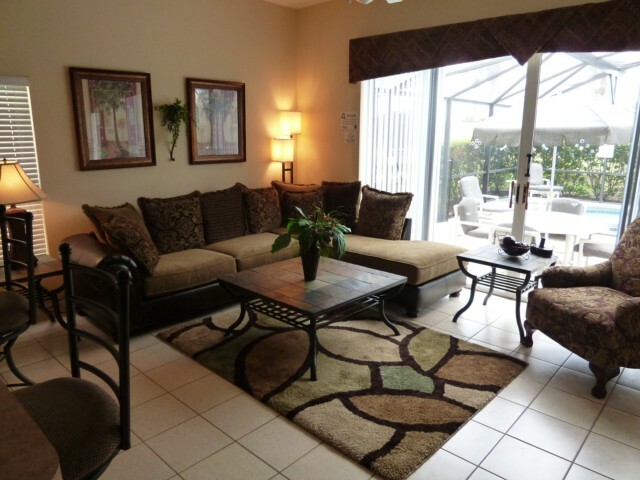 It is a lovely house, so well situated and had everything we could wish for. We will surely recommend it to all or friends and if we go back again we hope you still have it for rent. Just wanted to thank you again for renting us your lovely Villa.We had a really great time, the size is excellent for a large family and very convenient to everything. The pool was a godsend as the weather was beyond hot, so it was used every day and evening. Would gladly recommend your place to anyone interested and do hope to be able to rent it again in the future. I have been lucky enough to have travelled all over the world on holidays for around for the last 25-30 years and I can quite honestly say that this vacation was on par with some of the best I have ever had. 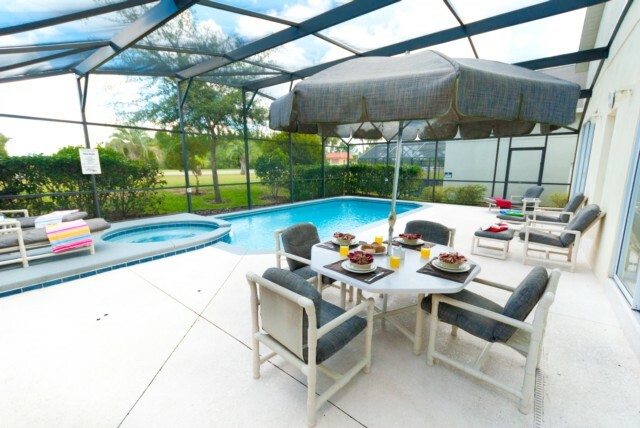 Besides the usual Florida attractions which obviously help make the holiday, what really made this holiday for us was the stunning villa and its beautiful location, space and facilities. Thank you ! It was a pleasure staying at your house ,our family had a great vacation! On behalf of my family I will tell you that we had a wonderful stay in your villa. 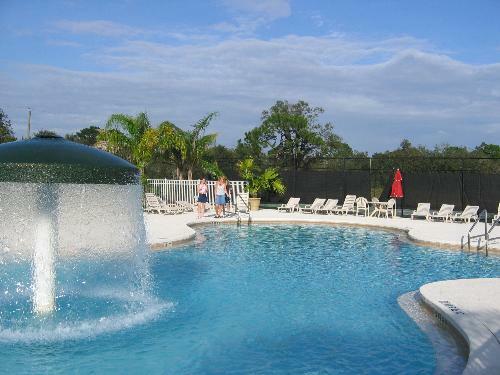 We loved it and will recomend it to any who are looking for villa in Orlando. If I will return to Orlando some day I will contact you. UK£85 / US$165 per week - recommended between the months of October & April. Just back after a 3 week stay and have to say this villa is up there with the best we have stayed in. The pool area is fantastic with plenty of space to relax after a morning at the parks. Only used the games room once as the pool was to much of a draw. 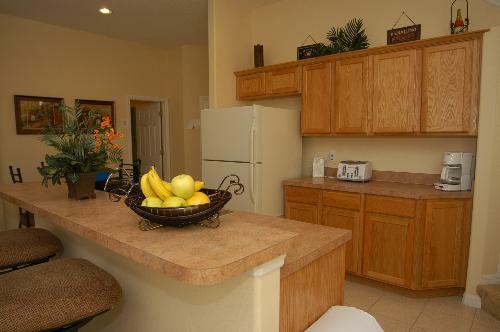 The villa is equipped with everything you will possibly need. We love Glenbrook as a base as its a short drive to shops and restaurants or a walk if your feeling up to it and only 20 minutes to Disney. Would recommend in a heart beat and hope to stay again sometime in the future. Going on holiday with the entire family of 9, we were all delighted at the space and luxury in the villa. With 2 lounges divided by an open plan kitchen the kids were able to have their own sanctuary after a day at the parks. The jacuzzi and pool was lovely with a large patio area. 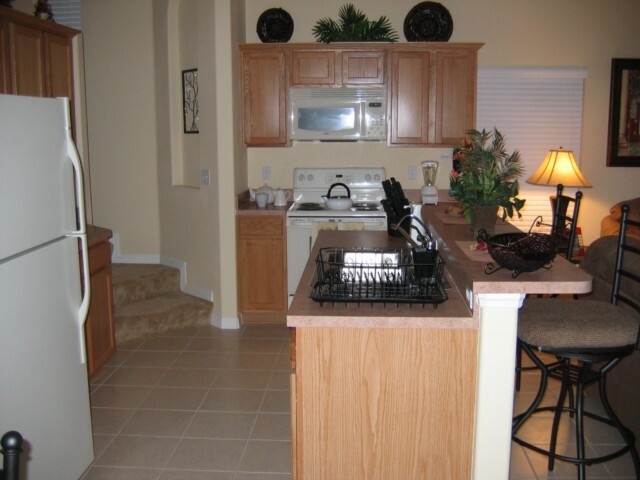 Everything was plentiful in the villa from towels for the waterparks to a well equipped kitchen. 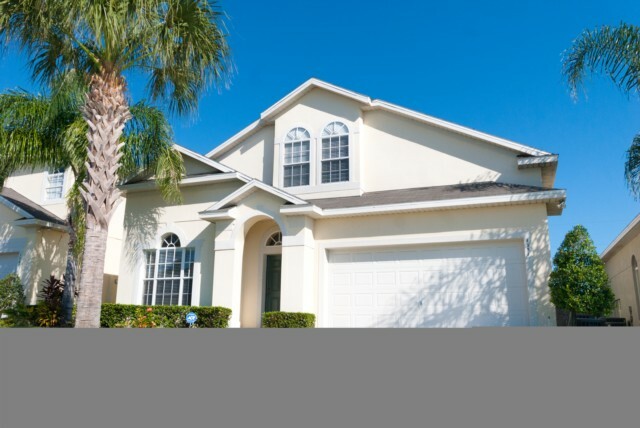 The house was situated in a nice friendly estate with easy driving to all the theme/water parks we visited disney,seaworld,busch gardens and legoland. The villa was in pristine condition well managed and it would be difficult to find a fault with it. It took me 20 minutes to drive to the parking lot at magic kingdom from the villa. Would have no hesitation recommended this villa to anyone. Your enquiry will be sent to villa ref 3340 only. This page has been viewed 53224 times since 27 Sep 2007.